I recently got the opportunity to review Courtney Robertson’s new tell-all book, “I Didn’t Come Here to Make Friends.” I read the book in a few hours so before you judge book by its cover or a person by their ITM (In the moment interview) I promise you should keep reading. I read the book without looking at any reviews or excerpts and I am glad I did. People seem to be caught up on the hot button issues, which are good and juicy I might add, but the book is more than that. Ben’s season was filled with a lot of entertainment, but Courtney was the entire show beside Jaclyn’s one-liners and Blakeley drama. As much as Courtney was given a hard time by everyone, including me at times, I always stayed true to the fact that season would have been a snooze fest without her. 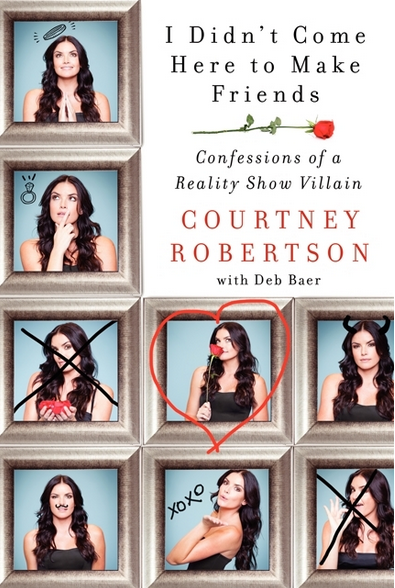 In the book, Courtney gives her side of “The Bachelor” story and the first thing you must know is she really did love Ben and confirms that the experience was real. Throughout the entire season it seemed like she just wanted to win and while the humor did not translate as well as it could have she honestly liked him and wanted their relationship to work. For all of the people who are upset about her calling people out, I think saying she is “throwing people under the bus” is a little dramatic and seems as if it is without merit. Now she does knock a few people off of their pedestals, but can you honestly blame her? She is one of the most vilified contestants in Bachelor history and if viewers saw some of the things she talks about in her book, then a few of the “favorites” wouldn’t have that title. 1. Courtney almost did not go on the show and even changed her mind a few times. 3. That every snappy comment usually had something to do with the Pink Ladies. 4. All about the hilarious scene that seemed straight out of the “Bridesmaids” movie. 5. The details behind the skinny-dipping situation and what happens in the fantasy suite. 6. Ben changed immediately after the show was over. 7. The Flajnik family dislikes chain stores and didn’t even like when Courtney modeled for chain stores. 8. Some things Bachelor secrets are so scandalous that names could not be revealed. 9. How and what happened during the short fling with Arie. 10. Ultimately, she wanted the relationship with Ben to work. She never claims to be innocent in the situations that viewers saw on “The Bachelor” but gives insight to the other sides of the story. You will not be able to put it down because it is juicy yet endearing, hilarious but still serious and everything in between. If you are a true Bachelor fan you will love this book and if you do not want to read it because of fear it might throw someone under the bus or be a little edgy, are we really watching the same show? “I Didn’t Come Here to Make Friends” is on sale today. You can get the book on Amazon, Harper Collins and more. If you do not read it I am not convinced you are here to make friends. Tweet me at @BachelorExpert or comment below. Disclosure: I received an early copy of the book to review by Harper Collins and Courtney Robertson. This review is completely based on my opinion of the book.